There was a decent chance Grant Kay wasn't supposed to be on the Dutchess Stadium field Monday. First, there was the whole decision-making process about whether to return to the University of Louisville -- where the right-handed slugger had batted .285 with with five homers and 23 steals in 65 games as a junior for the Cardinals en route to their second straight trip to the College World Series -- or to go pro after the Rays took him in the 27th round of the June Draft. While mulling his options, Kay headed to the Cape Cod Baseball League, the premier summer wooden-bat league for collegiate players. He went 14-for-26 (.538) with two homers and four doubles in only six games for Cotuit, and that short stint tipped the scales. "Excited to start the new chapter in my career! Truly blessed to have an opportunity to be a part of this amazing organization @RaysBaseball," he tweeted last Tuesday. But paperwork issues with Major League Baseball kept him from getting a guaranteed start date on his professional career. He was told it might not be until Wednesday (the day after the Major League All-Star Game). Fortunately, Kay got the go-ahead Monday and was slotted as Class A Short Season Hudson Valley's DH, batting fifth in the lineup in his pro debut. Then, he homered on the first pitch he saw. Then, he doubled. Then, he singled. Then, he singled again. Finally in the eight inning, he ripped a ball down the right-field line, put his head down and raced for his first triple in Minor League Baseball. And with that, Kay had cycled for the first time in his life, in the first game of his professional career. "I was definitely excited just to be here," he said after Hudson Valley's 16-4 win over Batavia on Monday. "I wasn't sure if I was going to be cleared to play, so I was just excited to be here and get my pro career going. Then I cycled, and I guess you could call it a pretty good day." An old friend and new teammate had a good front row seat for the feat. 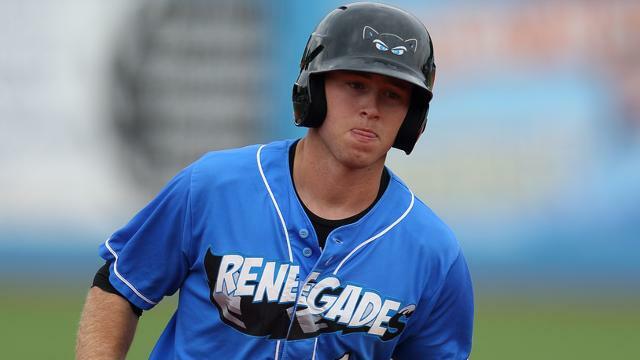 "It was pretty exciting to see," said Rays first-rounder Casey Gillaspie, who played with Kay on youth teams in their hometown of Omaha before the pair went to separate high schools. "He's always been a great hitter, and it's funny to be here because of this small baseball world. It was a lot of fun to watch, and hopefully, there's more to come, because it couldn't happen to a better guy." When you think of it, the homer alone would have been a cool enough story, one for the grandkids surely. The Renegades had jumped all over Muckdogs starter Jorgan Cavanerio with two singles and an RBI double by Gillaspie to start the game. Following a pop out by Hunter Lockwood, Kay stepped into the box for his first professional at-bat, and one pitch later, he connected. "From what I saw, they were throwing a lot of fastballs to us early on," he said. "So I was hoping to get something middle-in, and he gave it to me right on the first pitch. I swung hard, put a good swing on it and was lucky to drive it out." He carried that momentum to a leadoff double in the fourth inning and singles in the fifth and seventh. Needing the triple to turn the trick in his sixth and final at-bat, he later admitted that his aim wasn't exactly to end up on third. "My goal isn't to go up there and get a triple or get anything really in particular," Kay said. "I just wanted to compete and win the at-bat. When I got a piece of it, though, and saw it go over the first baseman's head, I ran as hard as I could and thought maybe I had a shot at the first cycle of my life." Upon reaching the bag, he was greeted by a hearty congratulations from manager Tim Parenton at third and excitement from both his teammates in the dugout and the 4,893 in attendance at The Dutch. Often, the first-game snapshot offers a chance to dream about a player's career. For instance, there were immediate calls for a Disney film about Daniel Nava's life after the Red Sox outfielder hit a grand slam in his first Major League at-bat back in 2010. Or there's the popular, but not always plausible, "He's on pace for..." meme that takes place both early in careers and seasons when players get off on their best of feet. Kay's eyes are on the future too, sure, but he's willing to leave Monday be what it is -- a special day that almost never happened. "I'm not going to cycle every day, I know that," he said. "My focus right now is just getting out there Wednesday and trying to get some more quality at-bats. Just go out there and have fun, same as every day." Kay was one of four Renegades with three hits or more on the afternoon as the home team finished with 24 hits in total. Gillaspie went 4-for-6 with a double, an RBI and two runs scored as the No. 3 man in the lineup. The 20th overall pick from last month's Draft has accrued multiple hits in three straight games and raised his averaged from .232 to .274 thanks to that stretch. "It's taken awhile, but I'm getting more and more comfortable here," said the switch-hitter. "I've got great teammates and a great coaching staff here, and I feel like I'm finally settling in. I'm just enjoying every day that I've been here so far."